Dongtae refers to frozen pollock fish. Dongtaejeon is one of the most common side dishes for special occasions in Korea along with bulgogi and japchae. Pollock is inexpensive compared to other fish and it’s nice and juicy when it’s pan-fried in batter. This recipe is almost the same as my cod pancake recipe (daegujeon), but I simplified some ingredients and process so that many people can make this more easily at home. Even though the recipe is simplified, it is still super tasty. Frozen pollock fillet, salt, ground black pepper, flour, eggs, canola oil (or vegetable oil). Take 1 frozen pollock fillet (about 200 grams’ worth) out of the package, rinse it in cold water, and set aside for 20 minutes. Slice it into pieces at a 45 degree angle. You should get 8-9 pieces that are ⅛ inch thick x 2 inches x 3 inches. Sprinkle a few pinches of salt and a bit of ground black pepper over the slices. Place ⅓ cup of flour in a bowl. Add the fish slices and mix by hand to coat them with flour. Beat 2 eggs in a small bowl with a few pinches of salt. Heat up a non-stick pan over medium high heat. Add 1-2 tbs canola oil to the pan. Dip each pollock slice in the beaten egg and place it onto the heated pan. Lower the heat and cook for 1 minute. turn it over with a spatula and cook 1 more minute. Add more oil if needed, and put more egg mixture on top of each slice if you want to make it yellower. Serve hot, warm, or cool. To make a fast dipping sauce, mix 1 tbs of soy sauce and ½ tbs vinegar in a bowl. Posted on Friday, June 10th, 2011 at 10:40 am. Last updated on April 26, 2015. Posted June 27th, 2017 at 7:23 am | Log in to reply. Posted July 1st, 2017 at 11:10 am | Log in to reply. Yes, you can use rice flour instead of wheat flour, but if you serve one day later you should pan fry it again quickly so it gets some crunch back. Posted March 2nd, 2014 at 10:37 am | Log in to reply. I think I’m starting to sound like a broken record…I can’t believe how delicious and easy to make this is! We didn’t have Pollock on hand so my wife suggested I use some perch fillets that we had. They turned out excellent! Your method for frying fish is different from the American way (or at least the way I’ve always seen it done). We first dip in egg and then the flour. Also we fry in much more oil. This way is quicker, cleaner (less oil splatter) and probably better for you because less oil. And I like the thinner coating as well! Posted March 3rd, 2014 at 1:20 pm | Log in to reply. yes, this way of cooking any ingredients is very easy and delicious. Posted August 14th, 2011 at 5:28 pm | Log in to reply. – I am part of KSA [Korean Student Association] at my community college [Northern Virginia Community College]. – i’m not sure if they’d let us, but if we could figure something out with enough planning time then perhaps the school could allow us to use the culinary kitchen they have for the Culinary Arts students?? who knows. but either way, it’d be AMAZING to have Maangchi ajumma as Maangchi Sunsengnim~ even for just a little while. – You’d probably have a blast exploring the Washington, D.C. area! Posted July 13th, 2011 at 6:13 pm | Log in to reply. Made these tonight and they were soooo quick and easy! I was suprised at how inexpensive the pollock is too. Bought a 12oz. bag for $2.39 at my local (American) grocer. Posted July 13th, 2011 at 6:18 pm | Log in to reply. Posted June 11th, 2011 at 9:56 pm | Log in to reply. WOW these pollock pancakes look awesome! I’m sure they smell really great as your cooking them :) Thank you Maangchi for sharing this recipe! I love how you always delivery such awesome delicious Korean food content along with your wonderfully entertaining videos. Keep it up! Posted June 10th, 2011 at 2:36 pm | Log in to reply. 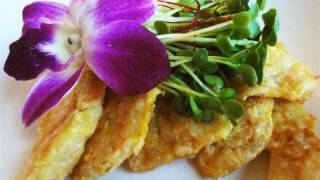 Ah, I loved the cod jeon, I can’t wait to try the pollock ones! Your hair looked just like your website art! Posted June 12th, 2011 at 10:36 am | Log in to reply. My avid Korean cook! I miss you! Posted June 13th, 2011 at 12:55 am | Log in to reply. 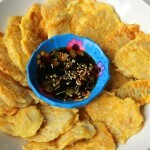 This recipe was originally posted on June 10, 2011 at 10:40 am by Maangchi. It was last updated on April 26, 2015. The video was watched 85,845 times on YouTube & has 774 likes!